This wonderful three bedroom, three bath Villa with over 2200 square fee of space to enjoy is perched above Bishop’s Lodge in a private, gated community with access to the community pool. 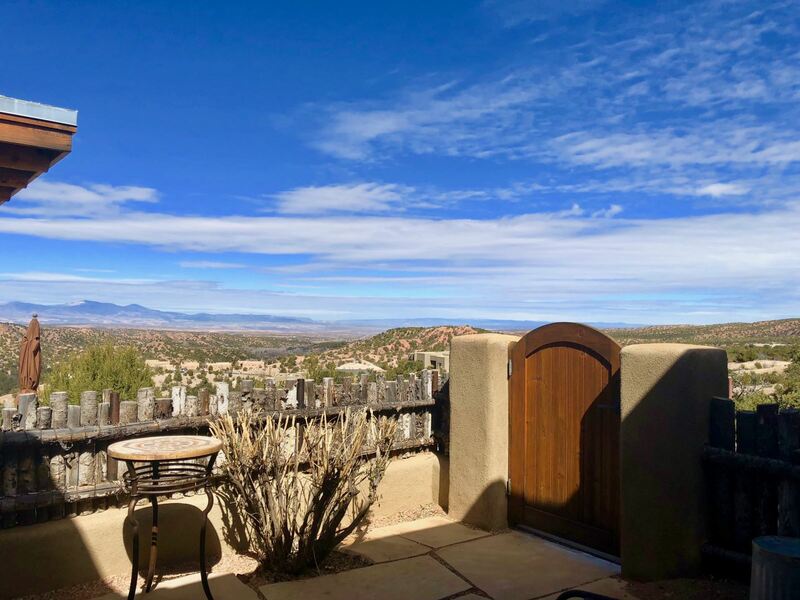 The views are unobstructed, panoramic views of the New Mexico sunsets and Jemez Mountains. 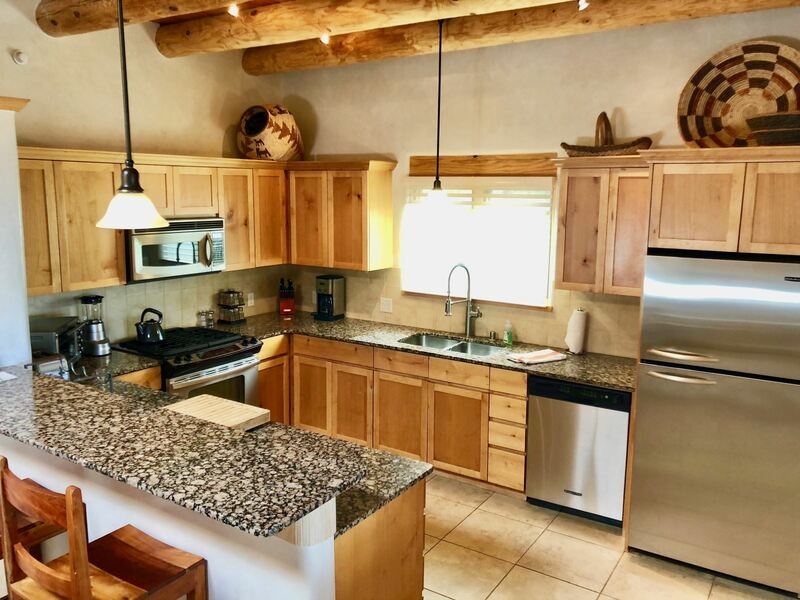 This prestigious location is just a few miles north of the Santa Fe Plaza. This free-standing villa has vigas, fireplaces and professional décor. 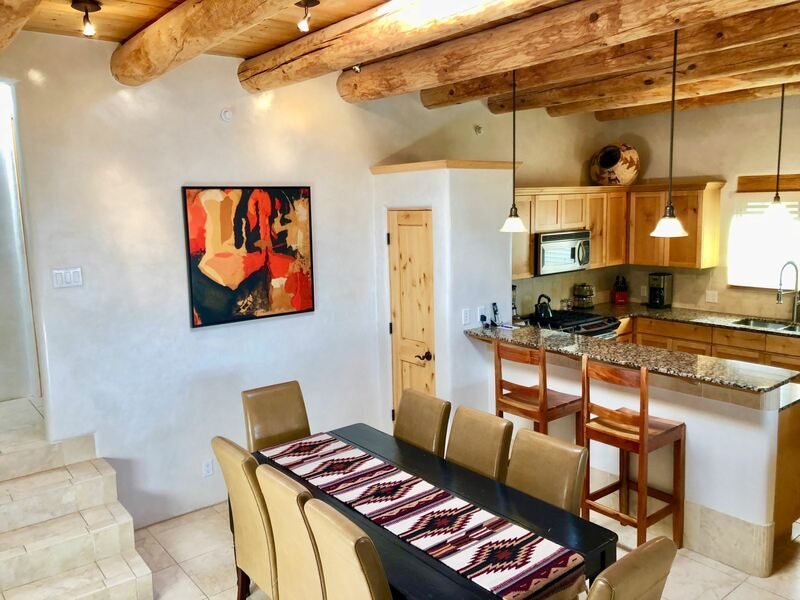 Tile floors compliment the décor for a more Santa Fe contemporary flavor. Enjoy the art, rugs, baskets and pottery lovingly arranged throughout the home for your enjoyment. The three bedroom suites are perfect for couples or a family. 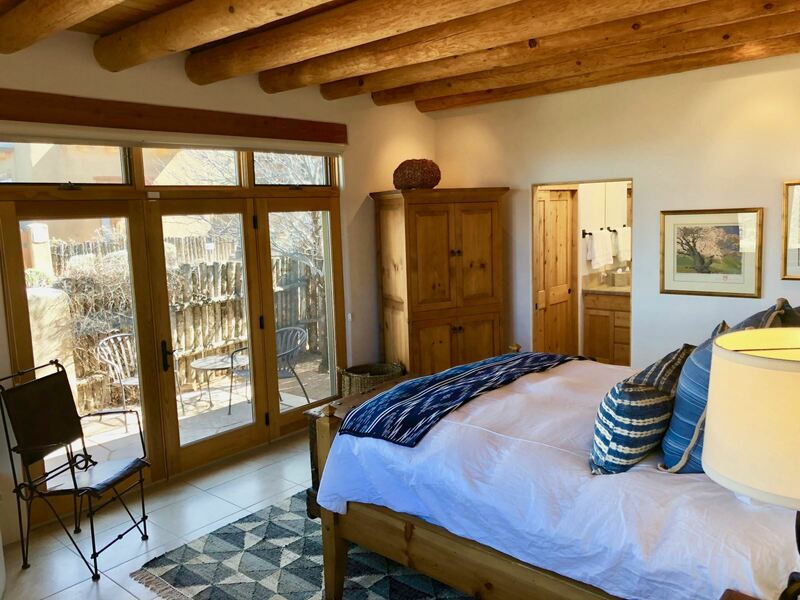 We offer versatility with the bedroom sleeping arrangements; the master offers a luxury suite with king bed, kiva fireplace, large bath with walk-in shower and deep tub, while the bedroom at the opposite end of the house offers a queen suite with fireplace and full bath. The middle bedroom can be made up as another king or with twin beds if that suits your needs more comfortably. The living room has a comfortable and welcoming seating area around the fireplace and TV. You can relax and watch a movie, the sunsets or just read a good book. The living area adjoins the dining room and kitchen. Every gadget is available for a quick breakfast or intimate dinner for your guests. The living area also opens to a lovely patio with table, chairs and chaise to relax and enjoy the Santa Fe climate. A grill is also provided for your enjoyment. Parking is available at the walkway to the property. This property is not affiliated with Bishop’s Lodge Resort and hotel services at the Lodge are not provided at this property. The home has central air conditioning. The owners may consider a well trained pet – a small dog. Proctor Property Management is unable to respond to issues with the pool. The pool is under the management of the HOA at The Lodge and Villas. A $10 per day pool fee will be added to the reservation between May 30th and October 10th.